David Suchet, CBE (/ˈsuːʃeɪ/ SOO-shay; born 2 May 1946) is an English actor, known for his work on British stage and television. He played Edward Teller in the TV serial Oppenheimer and received the RTS and BPG awards for his performance as Augustus Melmotte in the 2001 British serial The Way We Live Now. For his role as Agatha Christie's detective Hercule Poirot in Agatha Christie's Poirot, he received a 1991 British Academy of Film and Television Arts (BAFTA) nomination. Suchet was born in London, the son of Joan Patricia (née Jarché; 1916–1992), an actress, and Jack Suchet. Jack emigrated from South Africa to England in 1932, trained to be a doctor at St Mary's Hospital Medical School, London, in 1933, and became an obstetrician and gynaecologist. Suchet's father was of Lithuanian Jewish descent, the son of Izidor Suchedowitz, originally from Kretinga in the Pale of Settlement of the Russian Empire. At some point, the family name was recorded as "Schohet", a Yiddish (from Hebrew shochet) word defining the profession of kosher butcher. Suchet's father changed his surname to Suchet while living in South Africa. David's mother was English-born and Anglican (she was of Russian Jewish descent on her own father's side, and English Anglican on her mother's side). He was raised without religion, but became a practising Anglican in 1986, and was confirmed in 2006. Suchet and his brothers, Peter and John, attended Grenham House boarding school in Birchington-on-Sea, Kent; then, after attending another independent school, Wellington School in Somerset, he took an interest in acting and joined the National Youth Theatre at the age of 18. He trained at the London Academy of Music and Dramatic Art, where he now serves as a council member. His older brother, John, is a British television presenter and former ITN newscaster. Suchet's nephew is the broadcaster Richard Suchet. Suchet began his acting career at the Watermill Theatre, Bagnor, Berkshire; he has said that Watermill "fulfils my vision of a perfect theatre". In 1973, he joined the Royal Shakespeare Company. In 1981–82, he played Bolingbroke in Richard II opposite Alan Howard. Suchet played "John" in the drama Oleanna at the Royal Court Theatre in 1993. It was directed by Harold Pinter, and co-starred Lia Williams as "Carol". In 1996–97 he played opposite Dame Diana Rigg in the East-End production of Who's Afraid of Virginia Woolf? He was also featured as Salieri from 1998 to 2000 in the Broadway production Amadeus. In 2007, at the Chichester Festival Theatre, he played Cardinal Benelli in The Last Confession, about the death of Pope John Paul I. In 2014, he reprised the role of Benelli in the Australian tour of the play. He has been starring as Lady Bracknell in The Importance of Being Earnest by Oscar Wilde at the Vaudeville Theatre in London since June 2015 and on tour. My spoonful of curry stopped halfway to my mouth. I was astounded. Me, the serious Shakespearean actor, portrayer of men with haunted souls, playing a fastidious, balding detective? Brian sent me two Poirot novels and I became intrigued. The Poirot in the books was nothing like the character I'd seen on screen: he was more elusive, more pedantic, and most of all, more human. But I still wasn't sure whether I should play him. I called my elder brother John, then a newscaster at ITN, and asked what he thought. 'I wouldn't touch it with a barge pole,' John said firmly. 'Poirot's a bit of a joke, a buffoon. It's not you at all.' I gulped. It turned out he was right. Nonetheless, I was convinced that I could bring the true Poirot, as Agatha Christie had written him, to life. I told Brian that I would do it. The more I read, the more the little man entranced me. There were so many foibles and mannerisms — his need for order, his dislike of the country, his silver 'Turnip' pocket watch. I started to write a private list of his habits and character. I carried this dossier around on the set throughout all my years as Poirot, years in which I grew to love and admire the little Belgian. In 1989, he took the title role of Hercule Poirot for the long-running television series Agatha Christie's Poirot. In 2001, he had the lead role in the David Yates-directed BBC television serial The Way We Live Now and, in April 2002, he played the real-life barrister, George Carman (QC), in the BBC drama Get Carman: The Trials of George Carman QC. In 2003, Suchet starred as the ambitious Cardinal Wolsey in the two-part ITV drama Henry VIII opposite Ray Winstone as Henry VIII and Helena Bonham Carter as Anne Boleyn. In May 2006, he played the role of the fallen press baron Robert Maxwell in Maxwell, a BBC2 dramatisation of the final 18 months of Maxwell's life. During the same year, he voiced Poirot in the adventure game Agatha Christie: Murder on the Orient Express. At Christmas 2006, he played the vampire hunter Abraham Van Helsing in a BBC adaptation of Bram Stoker's novel Dracula. He appeared in the disaster film Flood, released in August 2007, as the Deputy Prime Minister of the United Kingdom at a time when London is devastated by flooding. Suchet appeared on daytime-TV chat show Loose Women on 6 February 2008 to talk about his film The Bank Job, in which he played Lew Vogel, alongside Jason Statham and Saffron Burrows. In 2008, he took part in the genealogy documentary series Who Do You Think You Are?, and discovered facts about his family history. This is the death of a dear friend. For years it has been Poirot and me — and to lose him is a pain almost beyond imagining. Poirot's death was the end of a long journey for me. I had only ever wanted to play Dame Agatha's true Poirot [...] He was as real to me as he had been to her: a great detective, a remarkable man, if, perhaps, just now and then, a little irritating. I think back to Poirot's last words in the scene before he dies. That second 'Cher ami' was for someone other than Hastings. It was for my dear, dear friend Poirot. I was saying goodbye to him as well — and I felt it with all my heart. With the exception of one short story, Suchet has played the role in adaptations of every novel and short story featuring the character written by Dame Agatha Christie. His first broadcast job was to read a "Morning Story" for BBC Pebble Mill Talks producer David Shute; they had met at the Mayor of Stratford's annual cocktail party to welcome members of the Royal Shakespeare Company to their new season. Suchet provided the voice of Aslan in Focus on the Family's radio version of C.S. Lewis's Chronicles of Narnia. He performed as the voice of the villainous Dr. Julius No in BBC Radio 4's radio adaptation of Ian Fleming's novel Dr. No. In 1991, Suchet played the part of Henrik Ibsen alongside Martin Shaw playing August Strindberg, in a one-off documentary on BBC Radio 3 about the meeting of the two playwrights. Suchet is vice-president of the Lichfield and Hatherton Canals Trust, whose most challenging achievement to date has been securing funding (both via an appeal and from influencing government decisions) concerning the building of the new M6 Toll motorway where it cuts the lines of the Lichfield Canal and the Hatherton Canal, both of which the Trust wishes to see reopened. He has also been officially voted in as chairman of the River Thames Alliance in November 2005. At the July 2006 Annual General Meeting of the River Thames Alliance, he agreed to continue being chairman for another year. He is a Patron of the River Thames Boat Project. Suchet's first major award was the Royal Television Society's award for best male actor for A Song for Europe in 1985. His performance as Agatha Christie's famous detective Hercule Poirot in the television series Poirot earned him a 1991 British Academy Television Award (BAFTA) nomination. In preparation for the role he says that he has read every novel and short story and compiled an extensive file on Poirot. Suchet was given a Variety Club Award in 1994 for best actor for portraying John in David Mamet's play Oleanna at the Royal Court Theatre, London. He later won another Variety Club Award (as well as a 2000 Tony nomination for best performance by a leading actor in a play) for his portrayal of Antonio Salieri in a revival of Amadeus. Suchet was nominated for another Royal Television Society award in 2002 for his performance as Augustus Melmotte in The Way We Live Now, which also earned him a BAFTA nomination. The same year, he was appointed Officer of the Order of the British Empire (OBE). On 10 October 2008, Suchet was awarded an honorary degree for his contributions to the Arts, from the University of Chichester. This was presented by the Vice-Chancellor at the Chichester Festival Theatre. In November 2008 Suchet won an International Emmy Award for Best Actor at the International Emmy Awards in New York for his role as tycoon Robert Maxwell in the 2007 BBC television film, Maxwell. He said: "It's been an unbelievable night for the Brits. I'm absolutely thrilled to bits, I can't believe it's really true. This is my first Emmy ever, and I can't tell you what it feels like to win for England because it's international, and to represent my acting community as well." On 7 January 2009, he was awarded Freedom of the City of London, at the Guildhall in London. On 13 July 2010, David Suchet was awarded an honorary degree from the University of Kent at Canterbury Cathedral in Canterbury. He was appointed Commander of the Order of the British Empire (CBE) in the 2011 New Year Honours for "services to drama". On 18 March 2014, Suchet was given a Lifetime Achievement Award at the RTS Programme Awards 2013 for his outstanding performance in Agatha Christie's Poirot. In 1972, Suchet first met his wife, Sheila Ferris, at the Belgrade Theatre, Coventry, where they were both working; he says that he fell in love with her as soon as he saw her, and that it took a while to persuade her to go out for a meal with him. They were married on 30 June 1976; the couple have a son, Robert (b. 1981), formerly a captain in the Royal Marines, and a daughter, Katherine (b. 1983), a physiotherapist. Suchet is the brother of John Suchet, a national news presenter for Five News and Breakfast Show Presenter on Classic FM (January 2011). He is the uncle of broadcaster Richard Suchet, who is the son of Suchet's youngest brother, Peter. Suchet's maternal grandfather, James Jarché, was a famous Fleet Street photographer notable for the first pictures of Edward VIII and Wallis Simpson and also for his pictures of Louis Blériot (1909) and the Siege of Sidney Street. Suchet first became interested in photography when his grandfather gave him a Kodak camera as a present. The Jarché family was originally named Jarchy, and were Russian Jews. Suchet's paternal grandfather, Lithuanian Jew Isidor Shokhet (shochet means "kosher butcher" in Yiddish; derived from Hebrew), lived in Kretinga, a Lithuanian city in the Pale of Settlement of the Russian Empire (until 1791 in Polish–Lithuanian Commonwealth; now in Lithuania). After escaping persecution to locate 16 mi (26 km) away Memel in German Empire, Isidor changed his surname to the still Yiddish, but Germanized with a Slavic twist, Suchedowitz, where Suched+o+witz resembles the Polish name (Slavic) construction structure of [root]+wicz with o in between when the last letter of the root is d, t, h, n, etc., e.g. Janowicz=Jan+o+wicz, made German-/Yiddish-like by replacing "cz" with "tz", e.g. Janowitz; also suche means "dry" in Polish), and then to Suchet after moving to Cape Town, South Africa. Suchet's maternal grandmother's great-grandfather, George Jezzard, was a master mariner. He was captain of the brig Hannah, which foundered nine miles off the coast of Suffolk during a terrible storm on 28 May 1860, in which more than 100 vessels and at least 40 lives were lost. Jezzard and six others of his crew were saved by local rescuers just before their ship sank. Raised without religion, in 1986, Suchet underwent a religious conversion after reading Romans 8 in a hotel Bible; soon afterwards, he was baptised into the Church of England. Suchet stated in an interview with Strand Magazine, "I'm a Christian by faith. I like to think it sees me through a great deal of my life. I very much believe in the principles of Christianity and the principles of most religions, actually—that one has to abandon oneself to a higher good." In 2012, Suchet made a documentary for the BBC on his personal hero, Saint Paul, to discover what he was like as a man by charting his evangelistic journey around the Mediterranean. Two years later, he would film another documentary, this time on the apostle Saint Peter. On 22 November 2012, the British Bible Society announced the appointment of David Suchet and Dr Paula Gooder as new vice-presidents. They joined the existing vice-presidents: John Sentamu (Archbishop of York), Vincent Nichols (Archbishop of Westminster), Barry Morgan (Archbishop of Wales), David F. Ford (Regius Professor of Divinity at Cambridge), Joel Edwards (International Director of Micah Challenge) and Lord Alton of Liverpool. Following the time when he bade farewell to his role as Hercule Poirot, Suchet fulfilled a 27-year ambition to make an audio recording of The Bible's New International Version, which was released on 24 April 2014. In August 2014, Suchet was one of 200 public figures who were signatories to a letter to The Guardian opposing Scottish independence in the run-up to September's referendum on that issue. The David Suchet Interview by Studio 10 (Australia) The ultra-smooth talking David Suchet aka Agatha Christie's Hercule Poirot drops by Studio 10. 1 2 "David Suchet interview: the clue to Poirot's long life". The Daily Telegraph. 13 May 2010. 1 2 "The Actor Behind Popular 'Poirot", The Christian Science Monitor, 25 March 1992. 1 2 3 "Inside the mind of a media monster". Yorkshire Post. 27 April 2007. 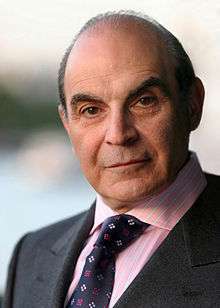 1 2 "David Suchet profile at". FilmReference.com. Retrieved 19 September 2010. 1 2 3 4 5 "Who Do You Think You Are?". BBC. Retrieved 19 September 2010. ↑ Fraser, Alasdair (24 November 2001). "Obituary of Jack Suchet: Obstetrician and gynaecologist who worked with Fleming on the role of penicillin in treating venereal disease". BMJ. Retrieved 25 September 2008. ↑ "David Suchet's grandfather". bbc.co.uk. Retrieved 20 November 2013. ↑ Nathan, John (21 May 2010). "Interview: David Suchet". The Jewish Chronicle. Retrieved 2 January 2011. ↑ Dodd, Celia (9 January 2009). "David Suchet still on the case". The Times. London. Retrieved 1 May 2010. ↑ "Interview with David Suchet". Dsuchet.ru. Retrieved 19 September 2010. ↑ Taffel, Jacqui (May 12, 2014). "Hercule Poirot actor David Suchet coming to Sydney's stage for The Last Confession". Sydney Morning Herald. Sydhey, Australia. Retrieved 2014-09-28. 1 2 3 Suchet, David (13 November 2013). "'My agony as Poirot drew out his last breath', by DAVID SUCHET: Shock as the little Belgian sensationally turns out to be the killer in his own final case (SPOILER)". The Daily Mail. Retrieved 1 October 2014. ↑ Sheehan, Sean (2009). Joyce's Ulysses: A Reader's Guide. Continuum. p. 106. ISBN 1847065198. ↑ "University of Kent awards honorary degrees to Orlando Bloom and David Suchet". Kent.ac.uk. 16 July 2010. Retrieved 19 September 2010. ↑ The London Gazette: (Supplement) no. 59647. p. 8. 31 December 2010. ↑ Poirot star awarded in UK honours, ABC News (Australia), 31 December 2010. ↑ "Poirot star David Suchet made a CBE in New Year honours list". The Guardian. 31 December 2010. ↑ "Winners Announced at RTS Programme Awards 2013". Royal Television Society. 18 March 2014. Retrieved 21 February 2015. 1 2 "Desert Island Discs with David Suchet". Desert Island Discs. 13 February 2009. BBC. Radio 4. ↑ "Jewish Names". Judaism 101. Retrieved 29 September 2014. 1 2 3 Lodge, Carey (21 April 2014). "David Suchet: Recording the NIV Bible is my legacy". Christian Today. Retrieved 19 March 2015. ↑ Whitnall, Bill (22 November 2012). "Bible Society announce Suchet and Gooder as new VPs.". British Bible Society News. Retrieved 2 December 2012.